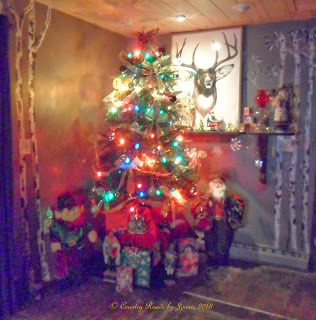 Country Roads By Joanie: Merry Christmas! Every year I'm faced with the task of finding the perfect gift for the man who fills my every need and wish. Christmas decorating this year was delayed until Christmas Eve because I was still adding the finishing touches to hubby's Christmas present. Welcome to Birch Corner. There is little room in our home now for much more than wall art. Over the years I've created many landscapes, still life, and decorative art pieces. Wall stenciling was also a fun hobby. Only recently have I mustered up the courage to attempt wall art. I'm very pleased with the way it turned out and it warms my heart when I catch hubby staring at this corner with a small smile on his face and a definite dream in his eyes. May your days be filled with peace, love, happiness, wealth and good health.